This three bedroomed holiday home is set amoungst the trees, off a private cul de sac in Paihia's premier residential area. The surrounding trees are popular with tuis and other native birds. It is within 10 minutes walking distance of Paihia's main beach and a reasonably short stroll to the town centre, restaurants, Russell ferry, etc. There is plenty of off street parking. The house has an open plan living, dining and kitchen area which opens onto a rear deck with an outdoor dining and BBQ area. There are three bedrooms, a bathroom with a shower, two toilets and a laundry area. The attractive interior layout is split level style with the bedrooms, bathroom, toilets and laundry set on a slightly higher level to the living area. The rear deck is not suitable for toddlers as it is 3 metres or so above ground level. The rear deck is not suitable for toddlers. The washing machine has a 2 minute pause at the end of the cycle. Do not try and open the washing machine door until "END" is displayed. There is a large parking area by the side of the lane, indicated by the two "3 Sullivans Road private parking signs" there may or maybe not be our boat trailer at the top of this area. 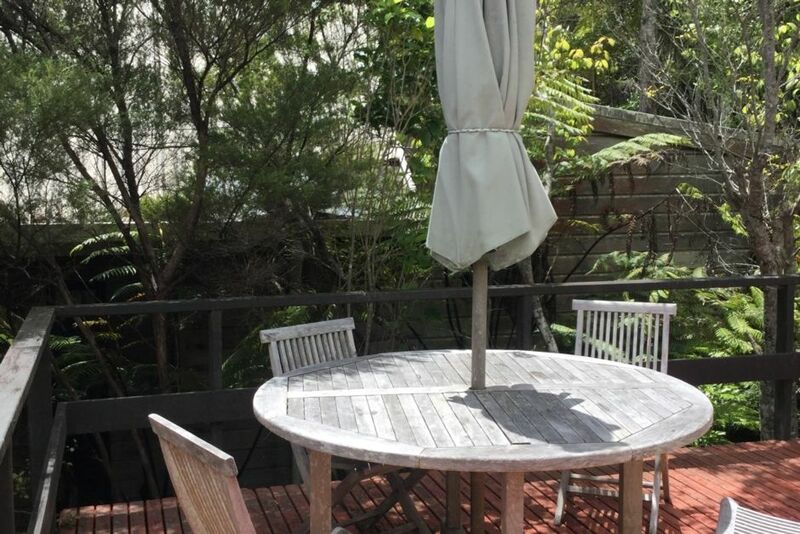 The property is conveniently located with all the facilities you need for a pleasant sound base in Paihia. It was a shame we could not use the deck more due to the inclement weather. However we found the Bach comfortable and plenty big enough for 5 adults. All the equipment needed for cooking and dining was provided as well as linen as requested. We would recommend this Bach to other guests. A perfect setting up in the trees. House was very welcoming, and has everything you need to feel at home. We loved it. The hammocks on the deck were especially good fun. Barbecue provided too. Thank you for a brilliant stay. We were very happy with the house and the communication from the owner. It was very unfortunate that the Wifi wasnt working - we did actually really need to do a bit of work so had to go into town searching for a place with internet access. Paihia is a lovely wee town and the house is an easy walk into the shops and bars etc. Lovely house in the trees! Comfortable and clean - this house was lovely despite the lack of view and the fact that the WiFi didn’t work. The layout separates the bedrooms from the living area and the deck and barbecue area were wonderful! A great little retreat, excellent location and split level layout well suited for two couples. Well-equipped and clear instructions given. The only drawback is the mustiness. This clears when the place is aired by opening doors and windows during the day, however, not the cupboard under the sink containing the cleaning products and the fry pans, which is particularly bad (to be avoided by asthma sufferers) and needs attention to get rid of the damp/strong smell. Glad you enjoyed your stay, thanks for leaving the house so clean and tidy.